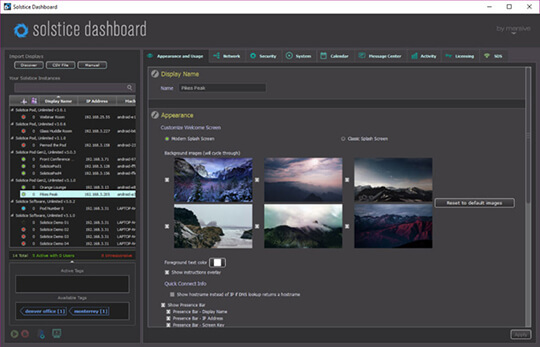 The Solstice Dashboard greatly expands Solstice’s management and control capabilities, transforming Solstice displays across an enterprise into networked IT infrastructure. With the Solstice Dashboard, IT administrators can configure and control every Solstice-enabled room from their PCs, post bulletins and emergency messages to the Solstice displays, and even perform basic help-desk support remotely. Learn about all the Solstice Dashboard can do by installing the demo software to virtually explore the Dashboard’s workflows and capabilities. 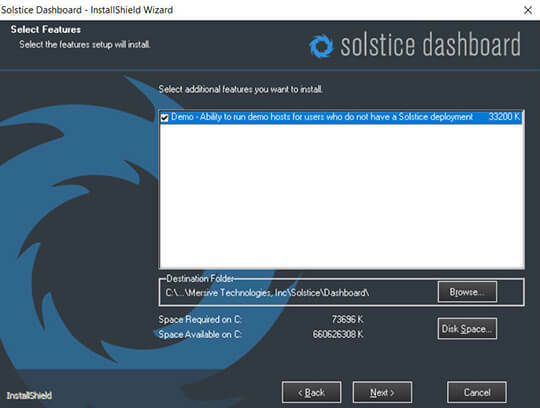 The Solstice Dashboard includes all configuration and management features available from the Solstice Pod and Solstice Windows Software configuration panels, as well as additional features and capabilities designed for the modern enterprise. The Dashboard must be installed on a host machine. The host may be a Windows 7, 8, or 10 computer or a Windows Server 2008 R2 or 2012 R2 with qWAVE installed. A Windows 2016 Server may be used if desktop experience is enabled. Submit the Solstice Dashboard form under Management Tools on the downloads page. Check your email for access to the Solstice Dashboard demo software download. 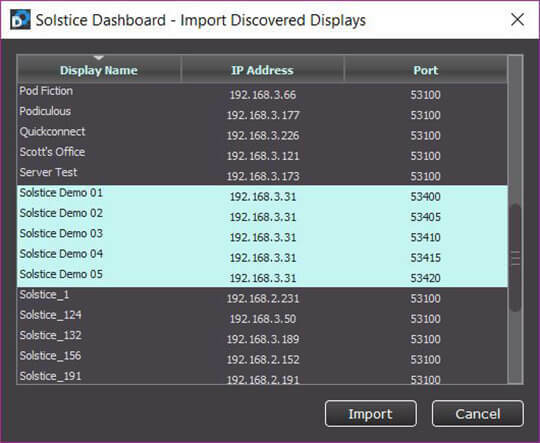 Download the Solstice Dashboard demo software executable file onto your Windows 7, 8, or 10 PC. Launch the .exe file once the download is complete and follow the installation instructions. On the Select Features portion of the installation process, enable the Demo option. When the installation process is completed, double-click the Start Solstice Demo Hosts icon. If prompted, opt for the Windows Firewall to Allow access for the Solstice display simulator program. A Solstice command prompt window will appear. Enter the number of Solstice demo host instances you would like to launch (5 instances is recommended) and hit Enter. 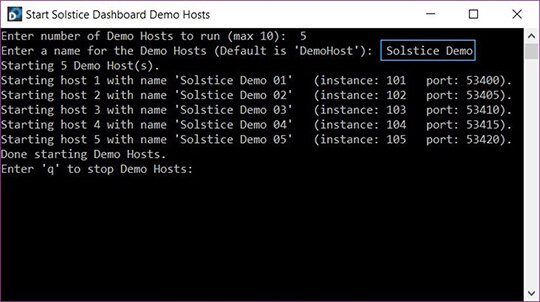 Enter a name for your Solstice demo host instances and select enter. If no name is entered, the default name “DemoHost” will be applied, and each instance will be assigned a number starting with “01”. Leave the Solstice command prompt window open, and launch the Dashboard application. Once launched, click the Discover button in the top left section of the Solstice Dashboard user interface. You will see the Solstice demo host instances you launched. Shift-click to select the demo instances, then click Import. Your Solstice demo hosts will appear in the instances panel (left side) of the main Dashboard user interface. From here, you can select one or multiple Solstice demo host instance(s) to virtually manage by updating the various options and settings that appear on the right side of the Solstice Dashboard interface. For a full overview of the functional capabilities of the Solstice Dashboard, please refer to the Solstice Dashboard Guide.